Monitor your animals or your home on your smart phone. Just download the free app to your smart phone and install the camera in a location where a WiFi signal is available. 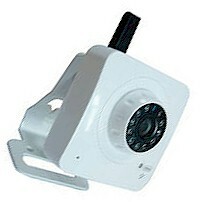 This is an easy to use - real plug and play IP cam. No router configuration is necessary. Simple to use ID and password. Two way audio, micro SD card recording ability. Camera has 11 LEDs for 20 ft. night vision and wide angle lens. When monitoring your home, you can turn on the motion detection and the camera will notify you via your smart phone when it sees movement. P2P (peer to peer) technology, without annoying IP settings.